Industrial gases are vital to the success of many different industries from food and beverage to healthcare, manufacturing, and water treatment. Many of these industries rely on an industrial gas supplier to provide them with the gases they need to make their products or provide their services. These suppliers act as invisible business partners to make modern life easier for all of us. The type and number of industries that rely on industrial gas is varied and far-reaching. Food And Beverage. Food and beverage manufacturers need an industrial gas supplier they can count on to provide them with gases like Carbon Dioxide, Nitrogen, and Oxygen to be used in food preservation and storage. Even modern refrigeration equipment needs industrial gases like ammonia and sulfur dioxide. Oxygen is used in fish farming (aquaculture) to maintain proper oxygen levels for the healthy growth of farm-raised fish and seafood. Entertainment. Plasma TVs rely on gases like neon and xenon while Nitrogen is used in semiconductor and circuit board manufacturing. Oxygen for treatment and therapy. Medical Air for the distribution of a medical gas. Carbon Dioxide for use in anesthesia and minimally invasive procedures. Nitrogen for cyrotherapy, cryosurgery, and lung function tests. Nitrous Oxide as an anesthetic or analgesic. Xenon can be used in MRI and CAT scanners. Chemical Manufacturing. Did you know that petrochemicals and fertilizers are produced with industrial gases? Oxygen, Nitrogen, and Carbon Dioxide are all commonly used. Steel Manufacturing And Metals. Metal production relies heavily on industrial gases. Oxygen is a main raw ingredient in producing steel and Argon is used to refine stainless steel and as a welding shielding gas. Acetylene is used for welding and metal cutting and Nitrogen can be used to heat treat metals. Water Treatment. Even the water we drink and use every day is treated with industrial gases. Oxygen and Carbon Dioxide can be used to disinfect and sterilize water, lower its pH level, desalinate or demineralize water. Despite the wide range of uses and applications for industrial gases, they all have one thing in common: the need for a reliable industrial gas supplier. An industrial gas supplier like Josef Gas can support many of these different industries to help them get their products or services to market and helping people. They are an indispensable, invisible partner in many situations with much more far-reaching influence that you’d ever expect. 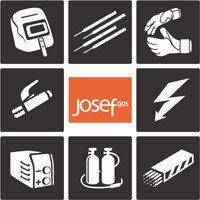 Learn more about Josef Gas and find out how to make us your industrial gas supplier at www.josefgases.com. Call 416.658.1212 or email info@josefgases.com for more information.